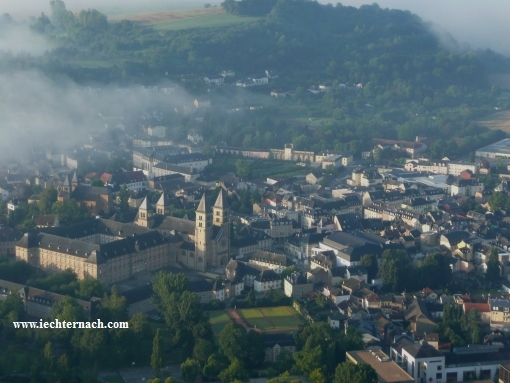 You want to visit Echternach? Practice sustainable tourism in the Mullerthal? Echternach is one of the major tourist centers in the Grand-Duchy of Luxembourg. The 1.300-year-old market town, with an even longer history, set in the exceptional landscape of the Mullerthal boasts a number of historic buildings and museums. In addition there is a river flowing through the town and a lake for recreational activities nearby. In short: Echternach offers its visitors a unique combination of nature, history and culture. Echternach is located in the picturesque valley of the Sûre (Sauer), 24 miles northeast of Luxembourg city. The river Sûre flows through the town. It forms the border between Germany and Luxembourg. Today it divides the historic town into Echternach on the Luxembourgish side of the river - and smaller Echternacherbrück on the German side. Echternach counts 5.600 inhabitants, 15 hotels, a modern youth hostel, three camping sites. Echternach is called Iechternach in Luxembourgish and Eechternoach in the local Echternach-Dialect. For tourism, iEchternach.com (together with iEchternach.lu) compiled practical information (top right of the page), but, here, you can find more than just information for tourists visiting the town. You can also find Images from the past (old postcards), what is said about Echternach on the news or on twitter. Furthermore here You can see photos from past events (slideshows) from in and around Echternach Also You can read stories of special interests, for example about ship-building in Echternach, the origin of the name Echternach, a film of the history of Echternach (history), or the industrial past of Weilerbach village (see: iechternach.lu; mostly written in German). A number of traditions and cultural festivities highlight the yearly calendar (events calendar). The most particular and the best known religious tradition is the Dancing Procession (Sprangprozessioun), which attracts thousands of pilgrims and even more tourists. The Dancing Procession was included in the UNESCO World Heritage List of Mankind’s immaterial Values in 2010. Then there is the prestigious international festival of classical music and in summer an open-air-party at the lake (e-lake). This free-entrance-festival attracts thousands of young people every year. Echternach also is the main town of the Mullerthal Region, Luxembourg’s Little Switzerland. This unique landscape, with its bizarre rock formations, its gorges and caves, its extensive, old forest and mossy brooks, its romantic castles and old villages attracts thousands of walkers and nature lovers every year. It features the 110-km-Mullerthal Trail and numerous regional or local tours. It is part of the German-Luxembourg natural park. A recreational centre with a 150-acre lake is situated two kilometers south of the town. For a detailed map, click map. Echternach looks back on two thousand years of history. There are many sights to visit. The Romans, the Merovingians, the Franks, the Benedictine monks, the burgers, have all contributed to the development of their fortified town. The architectural monuments include the remains of a big Roman, the 18th century Benedictine Abbey, the “Denzelt”, the natural beauty of the Mullerthal, St Peter and Paul Church - built on an ancient Roman castle, the Basilica with Saint Willibrord’s shrine and the medieval town wall.